Oil Sand Box: Chavez dead, bad news for the oilsands? Well in case you missed it, Hugo Chavez died last week. A lot of people are happy to see him go, but maybe Canada's oil industry shouldn't be among them. Under his term as president (1999 - 2013) Venezuela's oil production fell from about 3.5 million barrels per day to about 2.5 million barrels per day. This neglect was one of the reasons Canada's oilsands industry grew so quickly over the same period: US imports from Venezuela fell from a height of 1.4 million bbl/d in 1997 to 868 thousand bbl/d in 2011. Canadian exports to the US grew from 1.2 million bbl/d to 2.2 million bbl/d over the same period. The Financial Post has an article on the possible consequences for Canada. The basic fear is that if the Venezuelan oil industry gets its act back together it will provide a viable alternative to Canadian crude. PDVSA, the Venezuelan state owned oil company, was basically used as a cashcow by Chavez - they weren't left with enough capital to maintain or expand production. More money for PDVSA would likely mean more production from Venezuela. Further, if the new Venezuelan government is less anti-American than the last, there could be reduced opposition to their oil by the US government. In fact, it seems to me if Venezuela has a big about-face the American government might want to encourage this better behaviour by pushing for more Venezuelan imports. There are further issues, such as competition for labour and capital. The Orinoco Belt consists of heavy oil and quite similar in size but easier to produce than Alberta's oilsands. 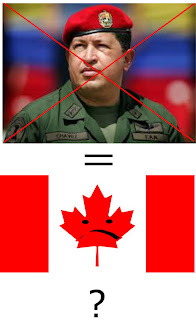 The article says 3,000 Venezuelan workers came to Alberta when Chavez purged PDVSA, and those people might now go home. Personally, I think the threat to Canada's oil industry is overblown. First off, there's no real indication that the new Venezuelan regime is going to be any better at managing the country's oil industry than the last. Chavez's vice president, Nicolas Maduro, is likely to win the election to replace him, and then he'll be president for 6 years. He seems to have the same bad ideas as his former boss, without the charisma, so I expect more of the same, particularly in Venezuelan-American relations. Even if Venezuela does turn itself around, however, I don't think that means "instant oil competitor". It can take decades to build production capacity back up after years of neglect, as Iraq has shown*. Also, as Canadian exports to the US grew, so did pipeline capacity. There is now a real capability to export over 2 million barrels per day. Those pipelines aren't going to disappear, so it's probably going to remain very cost competitive for the US to pipe in oil from Canada compared to shipping it in from Venezuela. I think a much bigger threat to Canada's oil exports is increasing American domestic production; it is both cheaper and politically preferable to Canadian crude. Anyway, I think the article is interesting in that it gives some global context to the oilsands. I think some of its conclusions might be a bit overblown, however.